Aratere is Maori for "Quick Path" and yard number 1570 was built in Spain by Astillero Barreras S.A. The 487.5 foot vessel can carry 369 passengers, 60 railway wagons (1,728 tons) , 20 tractor/trailer trucks, 100 automobiles plus another 30 cars in the lower cargo hold. With an overall length of 150 metres, a beam of 20.25 metres and a draft of 5.5 metres, she has a service speed of 19.5 knots. The open-sea section of the route is notorious for bad weather conditions, consequently the vessel has been fitted with a pair of Brown Brothers fin stabilisers and an Intering heel control system, which utilises two 860 cubic metre anti-heel tanks to alleviate the discomfort. This latter equipment also includes test facilities which enables the vessel's stability to be checked before sailing. The design incorporates the accumulated regulations enforced by statutory authorities in the wake of the Herald of Free Enterprise and other disasters. As a result she complies with the requirements for a 'one compartment' vessel and meets the demands of the Stockholm Rules and the Stab90 stability proposals, including the ability to withstand 5OO mm depth of water on the main deck. The profile broadly follows that developed for the AESA series, featuring a double skin hull within which there are two vehicle decks: the main suitable for both rail and road vehicles, and a partially enclosed vehicle deck above which carries lorries and trailers. This provides the base structure for the two-tier (plus wheelhouse) accommodation block, and incorporates the twin funnels at the aft end. A lower hold is also available for the carriage of cars. 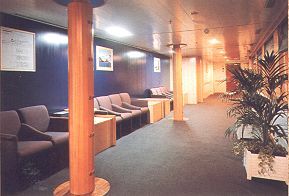 The 'Interislander' service is a daytime operation, with only ten double-berth cabins with private toilet facilities provided for twenty drivers who aiso have their own messroom and TV lounge. 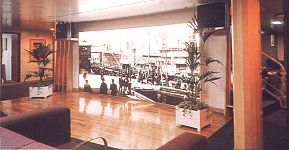 For the remainder of the 355 passengers there are a series of lounges, a self-service restaurant and cafe, tavern bar, cinema, TV lounges, writing rooms with work station provision, and outdoor seating. The main ro-ro access to Aratere is through the stern via shore-based link spans at the two terminals. These allow both railway wagons and road vehicles to be carried on the main (train) deck, which is fitted with 425 lane-metres of recessed rail track, suitable for Tranz Rail's new, wide bodied rolling stock. Alternative entry to this deck is through a side door in the aft port quarter. A hydraulically operated ramp connects with the vehicle deck above where there are 580 lane metres of parking for lorries and trailers. With a full complement of rail traffic, 160 cars can be accommodated, including 70 carried in the lower hold, accessed from the main deck by lowering a section of the deck hydraulically. Provision is made for carrying a whole range of cargoes excluding only those classed as infectious. All spaces (except the lower hold) can accept dangerous cargoes, and the train deck can take those of classes A, B and E stowage categories, with classes C and D added to the list of cargoes suitable for carriage on the vehicle deck. The machinery installation is based on the diesel electric principle, using four Wärtsillä 8L32 main engines, each developing 3,680 kw and driving an ABB alternator, These produce 3,550 kw electric current per unit to satisfy not only the 'hotel' electric loading for the entire ship, but particularly the ABB SAMI Megastar variable speed propulsion motors. These are connected in pairs by way of Reintjes twin input/single output gearboxes to the two propulsion shafts, each fitted with fixed pitch propellers to give a service speed of 19.5 knots. This is sufficient to cut 20 minutes off Aratiki's journey time and allow six crossings per day instead of four previously. Problems were experienced with this installation, both on the delivery voyage from Spain, and on Aratere's first service runs. Enhancing manoevrabilty at the terminals are two Kamewa 1,000 kW bow thrusters. An interesting innovation is the inclusion of an 'Konsailor' automated mooring system which provides a mooring load capacity in excess of 100 tonnes. Developed by Mooring International Ltd, of Lyttelton, it comprises four units located behind watertight doors, two forward, two aft, on the port side. Each unit is fitted with two l.2 x 1 metre pads within a holding frame which can be extended and retracted by means of a 20 tonne hydraulic ram, enabling the pads to be attached by means of a vacuum to flat steel plates positioned on the wharf face. The entire system is controlled from the bridge, with vertical displacement due to tides, fore and aft movement normally countered by spring lines, and shifts caused by heel, compensated for. 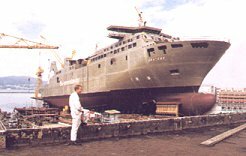 After running on only one engine for four months, the two year old vessel was dry docked at Auckland for two weeks in April, 2001. A hole was cut in the rail deck and a replacement Wärtsillä diesel engine block fitted. A computerised engine management system restricts the vessel from running at more than 87% of her capacity. The main limitation of the 12,300 ton vessel is her low passenger capacity, which makes it hard to fill the entire vehicle deck at peak times. The restriction rules out carrying multiple coach tours, as three or four bus loads would exhaust most of the passenger capacity. It also means that Tranz Rail can't clear passenger backlogs as quickly as it would like after service disruptions. It is also understood that there are vehicle ramp alignment problems when the vessel berths at high tides. 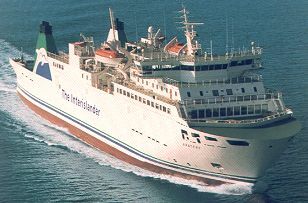 New Zealanders are not allowed to know that this poorly designed and trouble plagued vessel cost NZ$132 million, that information is claimed to be "commercially sensitive" by her proprietors. 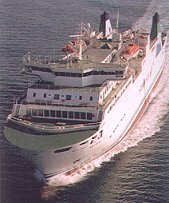 Most of them would also be suprised to know that the pride of their domestic fleet is in fact a foreign vessel. Owned by the Wilmington Trust, an affiliate of Citicorp USA, she is leased to Tranz Rail for 15 years and sails under a Bahamian flag of convenience. Deck plans and detailed specifications.